Intentional referential gestures, a fundamental building block of symbolic human language, have been reported from a range of species, including non-human primates. While apes are known to spontaneously use intentional gestures, only captive macaques, amongst non-ape primates, appear to intentionally display learnt gestures. On the other hand, referential gestures have so far been reported only in chimpanzees, amongst non-human primates. We document here, for the first time, potentially referential gesturing, used intentionally as well, in a monkey species, the bonnet macaque Macaca radiata, in the wild. Bonnet macaques use four distinct actions during allogrooming, possibly to indicate a particular body part intended to be groomed. These acts were successful in drawing the recipients’ attention to the indicated part, which they began to groom subsequently. This study enriches our understanding of non-ape primate gestural communication and adds to the growing evidence for early human language-like capacities in non-human species. The online version of this article (doi: 10.1007/s10071-016-1012-3) contains supplementary material, which is available to authorized users. AS is grateful to the Cognitive Science Research Initiative of the Department of Science and Technology, Government of India, for a grant that supported this project. SG expresses her deepest gratitude to the National Institute of Advanced Studies for a doctoral fellowship, Kantharaju H C, Karnataka Forest Department, for granting permission for this work, Jagadish M and Sharmi Sen for helping during data collection, and Karthik Davey and Sukanta Das for providing logistical support during the fieldwork. AS and SG are indebted to Josep Call, Richard W Byrne, Simone Pika and Catherine Hobaiter for their insightful comments on the study. A part of this work was presented at the Twenty-Fifth Congress of the International Primatological Society, Hanoi, Vietnam, in August 2014. This study was funded by a grant from the Cognitive Science Research Initiative of the Department of Science and Technology, Government of India (Grant No.SR/CSI/44/2008). Both the authors declare that they have no conflict of interest. 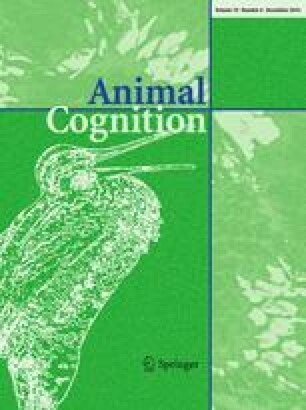 This study involved only non-invasive, observational methods, performed on free-ranging macaques in accordance with all applicable international and national ethical guidelines and with those of the institutions to which the authors are affiliated.